I was recently able to travel to Austin Texas for work, and wanted to share some snapshots of my favorite moments with you all! First, what is 'work'? I recently had someone ask me that question, so I thought it'd be fun to address that part of my life a little more. My full time job is with Boulevard Brewing Co. in downtown Kansas City, and I've been with my beer comrades since 2013. I feel very lucky that a big chunk of my job is to research new vendors + products to bring in to the gift shop, so with this trip that was our main task! Our first stop was Blue Owl Brewing! Their tasting room space was instantly inviting & cozy, (and if you're lucky, four of the cutest pups will greet you at the door). 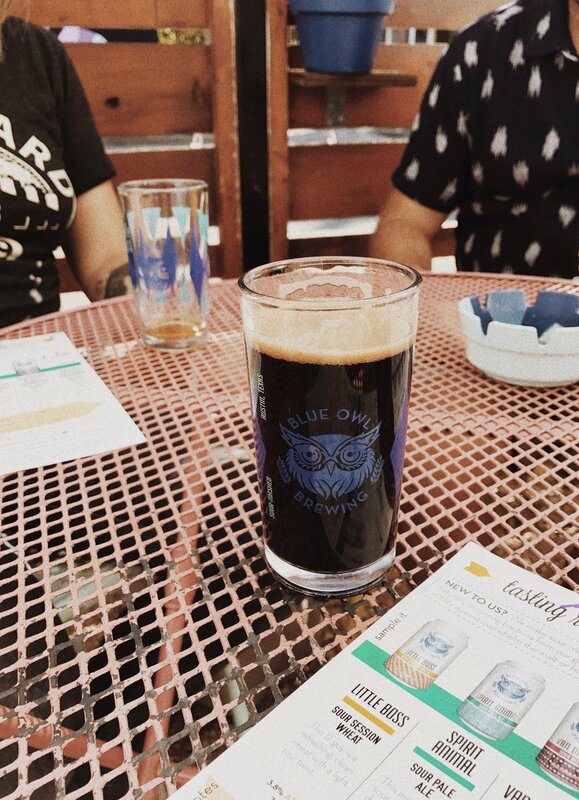 Blue Owl has mastered the art of sour-mashing beer, and their tasting glass quickly turned into a favorite souvenir of the trip. Walking to get morning tacos & coffee quickly became a tradition on the trip, and I loved exploring Seventh Flag Coffee. A place for visitors & locals alike, it is simply decorated and brews a delicious cup of joe, (not to mention the folks who were working couldn't have been nicer). It will be on the list of places to head back to next round! Is it appropriate to describe a food truck as dreamy? Cause Paperboy was DREAMY. If I hadn't constantly been eating small meals that whole day, I would have been all about their Goat Patty Melt. The best part? They were parked outside of Radio Coffee & Beer, which was home to one of the best iced americano's I've ever had. So much beauty surrounding us at every turn. Somewhere beautiful on Rainey Street.. I know this sounds kind of silly, but getting to see a Tom's store in the flesh was a dream come true. Many college papers were filled with subject lines & detailed information about Tom's shoes, so to experience a retail location made that feeling come full circle. Such a fan of their mission & products! 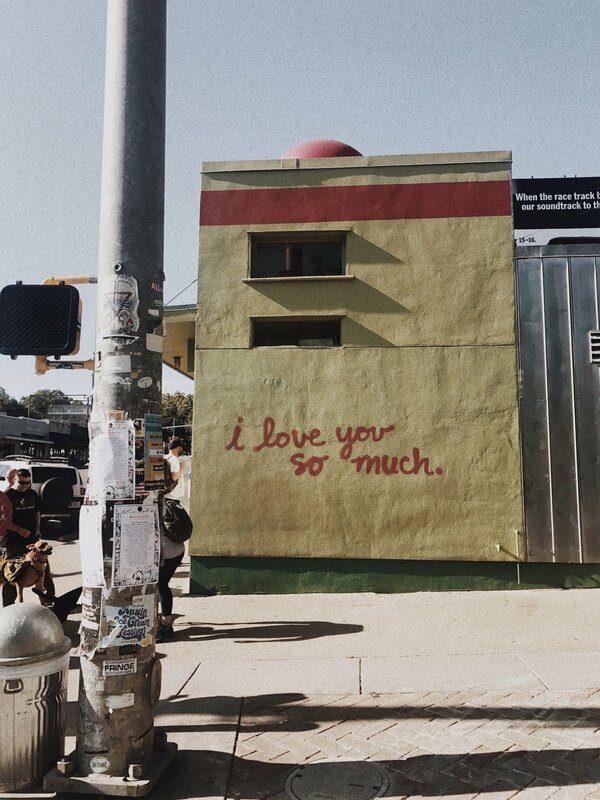 This famous little wall is located on the side of Jo's Coffee, which people line the streets for daily. They are known for their Turbo coffee beverage, but if you're not a sweet java drinker, I had the Belgian Bomber and it was delicious! I will not lie to you; I came to this spot because I had sources tell me it was home to a delicious beverage, the frosé. (Sources being Instagram ;) Thank you social media for leading me to my favorite new drink). I highly recommend walking through and looking at the lush greenery & gift shop as well! Oh Austin Beerworks, how I love thee. This place was the coolest, and the worker we interacted with that day was incredibly helpful & hospitable. I connected so much to the bright colors & fun packaging. This spot is one not to be missed when heading through on your next trip! The next couple photos are from a morning coffee walk, (and I will plug the address here for anyone that wants it for the mural location below!) These were some of my favorite moments of the trip. I feel so thankful to have been able to go on two totally different trips so close together. This world possesses so much beauty, and I feel grateful to experience it on a small scale every once in awhile. Never stop exploring, friends. Here's to the adventures; big or small.. may they lead you exactly where you need to go.